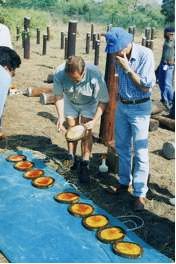 Trials run in the late 1980’s using the combination of boron and fluoride were carried out in laboratory environment in conjunction with the Commonwealth and Scientific and Industrial Research Organisation (CSIRO) confirmed adequate fungitoxic levels could be diffused into hardwood pole timbers. The industry standard in Australia is now this combination of actives in a slow release form with the shape of a rod insert for internal decay and a bandage wrap for external decay. Numerous inservice field trials of both methods have been completed and are still continuing. The Australian trials include locations in Victoria, NSW and Queensland where conditions and timber species vary considerably. 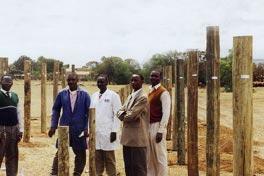 Extensive trials in other locations include Kenya, Sth Africa (four sites) and Uruguay. Poles sampled to determine penetration and retention levels of active ingredients over a ten year period have revealed more than adequate levels of active ingredients required to provide protection were detected in the timber. Unlike pressure treatments, remedial treatments rely on diffusion pathways and are capable of penetrating deeply into heartwood. Trials have confirmed this to be the case. 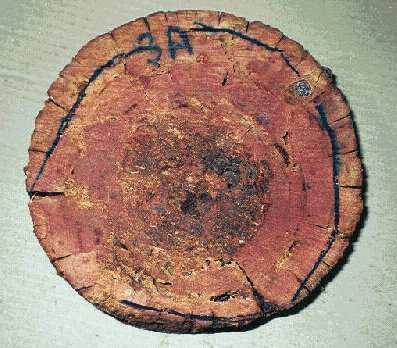 The tests also confirmed that in decayed timber most of the chemical diffuses into the pole within the first few months killing any active decay fungus, and the treatment still remains active well after the rod or bandage has dissolved. This is an important result as it demonstrates the increased likelihood of extension of life of the pole irrespective of what may occur to the pole in the future. 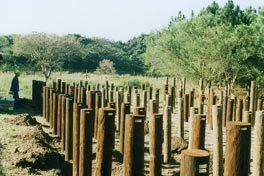 The rate of defective poles identified at the time of inspection is one obvious indication on the effectiveness of remedial treatment. Remedial treatment has been utilised in Victoria since 1988 to current date. Powercor City Power (a large Distributor based in Victoria in the south east of Australia) has a pole population of 500,000 and commenced a pole maintenance and treatment program in 1989. The result of this initiative has been a reduction in condemnation rate from 2.9% in 1987/88 to 0.4% in 1995/96. While this is partly due to an improvement in inspection techniques, the major impact has been remedial treatment of poles affected by decay. This trend is quite typical of most other Authorities adopting pole inspection and remedial treatment programs.